The Institute of Technology is getting into the holiday spirit. 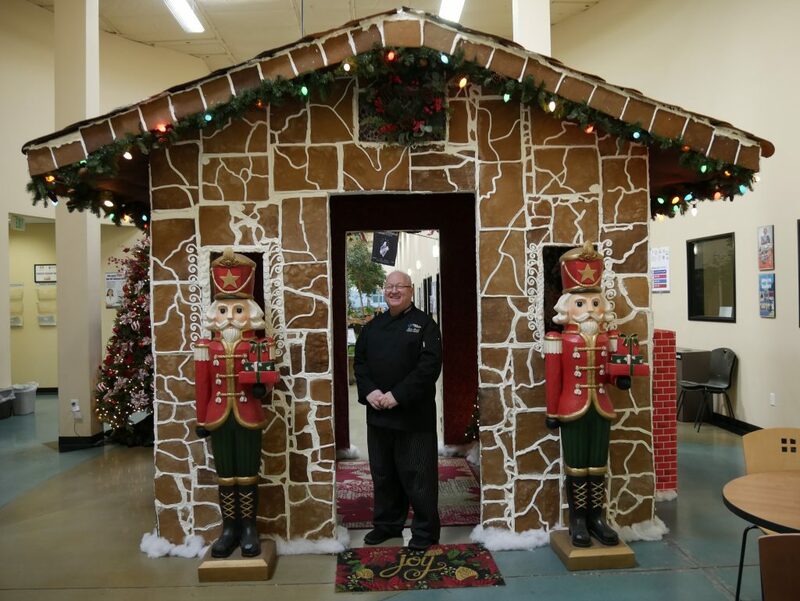 Over the weekend, culinary students put the finishing touches on a 10-foot tall gingerbread house located in the lobby of the school’s main building. Altogether, the house is made up of 750 pounds of gingerbread and 300 pounds of royal icing. “You can smell it when you walk in,” said Arnett, a Christmas aficionado. The house, however, wasn’t just a culinary project. Students from IOT’s technical department also came out and helped by constructing a plywood structure to serve as the foundation. “It took them about a week to build the structure and then it took us another week to put the gingerbread on and decorate,” said Arnett. In order to securely attach the gingerbread, students used the hard-drying royal icing. Decorations like garland, wreaths, lights, holiday-themed fabric, life-size nutcracker figures and a mini Christmas tree soon followed as the finishing touches. Another unique detail is a robotic Santa Claus trying to wiggle his way out of the chimney to reach the glass of milk (hardened frosting) and cookies sitting on a corner table. Arnett encourages visitors to stop by and see the finished product before it’s time to take it down.